I have resisted writing a post about notable architects who happen to be women for a long time. Partially because these lists can be found on other websites that are most likely better researched and organized, but mostly I’ve held off because I’d like to think that a good architect is not defined by gender or that being a good architect and a woman isn’t a singularly special occurrence. I can’t presume to understand the nuances that come along with being a female working in this profession – it’s not just about sitting in an office with co-workers who respect your abilities regardless of gender. It’s about all the other aspects of being a practicing architect where challenges present themselves. I can’t recall having ever worked with a female contractor – what would it be like on a job site? Would a female architect have to endure (or enjoy) the same relentless number of fishing and hunting stories that I hear (despite the fact that I don’t hunt or fish)? I don’t know but I assume the tenor of the typical job site conversation would be different – not more or less respectful, just different. It could be the little things like the type of shoes someone chooses to wear. Does that really matter? Probably not but I can bet you that the construction worker who has never noticed what shoes his wife is wearing would notice what is on the feet of a female architect visiting the site. The overwhelming majority of emails I receive are from women and the subject frequently includes a question about the challenges of being a woman in this profession. I do my best to address their concerns but I am but one voice. It would make more sense on one hand to ask these questions to a woman who is in the field of architecture rather than myself – but maybe that’s the point. How do I (a man) feel about women in architecture? I don’t feel anything because I expect them to be here. Kazuyo Sejima is a leading exponent of contemporary architecture. In 1981, she earned a degree in architecture from the Japan Women’s University and began working in the studio of Toyo Ito. In 1987, she opened her own studio in Tokyo and in 1995, together with former employee Ryue Nishizawa, she founded SANAA, the Tokyo studio that has designed some of the most innovative works of architecture built recently around the world. A list of notable projects includ the New Museum of Contemporary Art in New York, the Serpentine Pavilion in London, and the Christian Dior Building in Omotesando. She and her partner, Ryue Nishizawa, share the 2010 Pritzker Architecture Prize..
Zaha Hadid was born in Baghdad, Iraq in 1950, and in 2004, she became the first woman to win a Pritzker Architecture Prize (there had been 27 previous winners by this point). Her work experiments with new spatial concepts and encompasses all fields of design, ranging from urban spaces to products and furniture. I can still remember the first time I saw a Zaha Hadid project; it was 1990 and I was in college studying to one day become an architect. The project was the Vitra Fire Station and I was excited and confused at the same time – I quite honestly didn’t know what to make of it – it didn’t seem to follow any rules – including gravity. Marion Mahony Griffin was Frank Lloyd Wright’s first employee, and she became the world’s first woman to be officially licensed as an architect. Like many other women who were architectural pioneers, Marion’s contributions as Wright’s employee was lost in the shadow of her male associates. Nevertheless, Marion contributed greatly to Wright’s career and also to the career of her husband, Walter Burley Griffin. 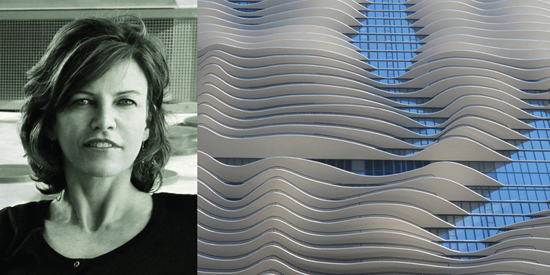 Jeanne Gang is principal and founder of Studio Gang Architects, a 36-person architecture firm in Chicago, that has been recognized for its innovation and leadership in design. Ms. Gang’s work represents a diverse range of building typologies, from large-scale undertakings such as the 82-story Aqua Tower in downtown Chicago, which reconsiders the tall building as a site-specific structure, to the SOS Community Center on Chicago’s South Side, which visibly engages with the distinct material properties of concrete. In all of her projects, Ms. Gang explores new creative territory in materials, technology, and sustainability, and her work with Studio Gang has received national and international awards and recognition. Julia Morgan was the first woman to study architecture at the prestigious Ecole des Beaux-Arts in Paris and the first woman to work as a professional architect in California. During her 45-year career, Julia Morgan designed more than 700 homes, churches, office buildings, hospitals, stores, and educational buildings, including the famous Hearst Castle. I have a giant book on the work of Julia Morgan sitting my desk which is what finally prompted me to finish this post – I want to learn more about this person because the architecture she created appears stunning. Over the past century, there have been many husband-wife teams. Typically the husbands have attracted the fame and glory while the women worked quietly (and some would argue, intelligently) in the background. However, Denise Scott Brown had already made important contributions to the field of urban design when she met and married her husband, Robert Venturi. Although he appears to be more frequently in the spotlight, her research and teachings have shaped modern understanding of the relationship between design and society. There is a great interview of Denise Scott Brown conducted by Silvia Micheli here. Julie Eizenberg is another example of a successful husband and wife team. Forming Koning Eizenberg Architects (KEA) in 1981 with Hank Koning, Eizenberg and her partner have refocused architects’ attention on the value and design potential of socially responsible projects by demonstrating architectural excellence in the design of many tight budget, affordable housing projects and community buildings. In their buildings, one is encouraged to discover space and architecture for oneself guided by compositional cues, landscape strategies, spatial sequence and scale change. The result is innovative architecture with a rare kind of humanism. For me, I have always been drawn to their work because unlike the work of many others, the solutions always seem to be expeditiously solved using common materials in a clever way instead of relying on bleeding edge technology and big budgets. I am a big fan of this firm. Victoria Meyers is a founding partner of hanrahanMeyers architects (hMa). Ms. Meyers has been the principal designer on a number of award winning projects in the firm whose projects include public institutional buildings, urban master plans, and award-winning residential projects. To make things even better, hanrahanMeyers architects maintains a blog – which was actually the very first architectural blog I started reading (and it’s a good one full of real architectural information – unlike this one). The Beverly Willis Architecture Foundation (BWAF) is a 501 (c) 3 non-profit research organization whose mission is to advance women’s contributions in shaping the built environment. 1900 – There are thus far 39 formal 4-year architectural program woman graduates in the US. 1958 – Currently there are a total of 320 registered women architects, which equals to 1% of the total number of registered architects in the US. 1988 – The number of female licensed architects is approximately 2100 (about 4%). 1999 – The number of female licensed architects is approximately 30,000 (about 15.5%), and the proportion of principals or partners who are women is 11.2%. 2002 – The proportion of female licensed architects is about 19.9%, and the proportion of principals or partners who are women is 20.7%. Collected from the University of Illinois at Urbana-Champaign with additional statistics courtesy of the Almanac of Architecture and Design 2004. Washington, D.C.: Greenway Communications, 2004.